A couple of weeks ago, our friend Liz from Savvy Seasons by Liz gave us a tutorial on how to make cloches using very economical items from the Dollar Tree. and this was the perfect project to finish it off. which I would be sharing with you all, but all the credit goes to her! 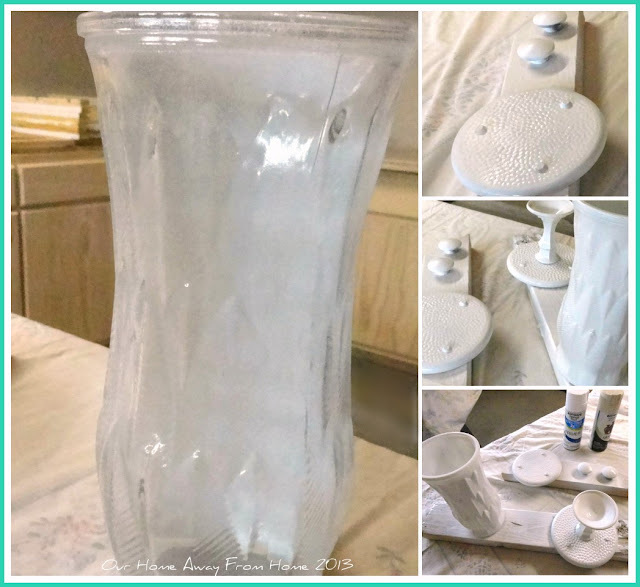 I took this idea of spray painting with stone paint a little further and also covered an old glass vase I already had. I will be sharing the kitchen Spring decor as soon as I can edit my pictures. Working on it. And here are my cloches! I followed Liz's directions. First I primed all the pieces. This is the paint I purchased. but this new superglue worked very well also. Waiting for the stone paint to dry. And my little bunnies have a new home this Spring! Thank you, Liz, for the idea and inspiration. I will share soon how I incorporated this project into my Spring decor for this year. Thank you for taking the time to stop by and leave a comment. It means so much to me! Those are amazing! I love the paint you used! Darling with the little rabbits! Great project! Your cloches are so pretty. Spring is around the corner hopefully! These are great! Your little bunny is so cute! What darling Spring cloches. Think I'll head for my Dollar Store! Very cute, Maria Elena! I love your bunnies, too! Oh, they are adorable! Yep, I watched Liz make her cloches and have been wanting to go buy knobs and the E6000. Soooo cute!! You did a great job! Your Spring decor is so pretty! So cute! I made some of these myself after also seeing Liz's tutorial! I plan to share mine in a day or two! Great job!! This is so cute!! 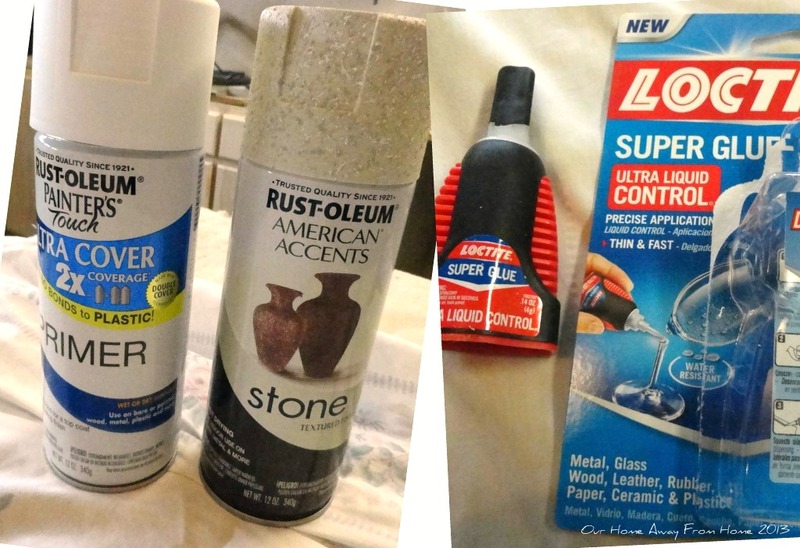 I have to look into this stone paint, I have ideas already! What a great idea...and cute! Thank you for sharing. 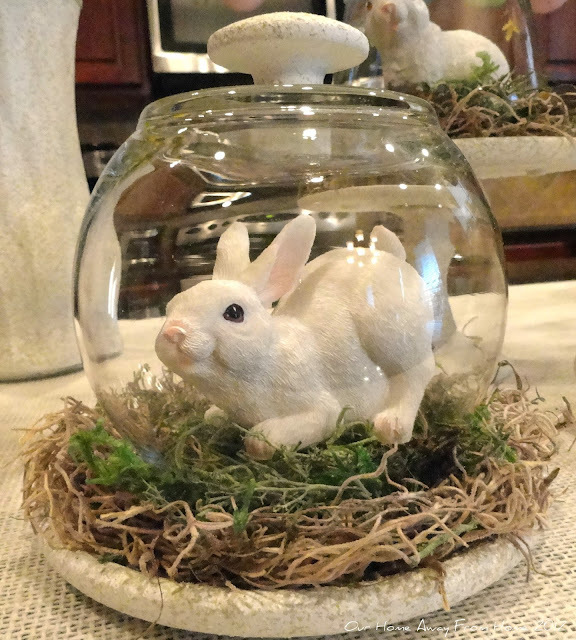 Oh Maria Elena, those are the prettiest cloches! You did a wonderful job creating them! Oh, Maria, your cloches are gorgeous! You did such a beautiful job and your little bunnies look very content. HI THERE...thanks for stopping in to visit my blog. New visitors are always fun. Wow, that project turned out really well. I am extremely useless when it comes to crafting. NO. KIDDING. Love the bunny under it. I will be back to see how you did your spring decor. This is so cute! That little Liz certainly comes up with some clever ideas -- she has such a fun blog! I found an old Christmas cloche at Salvation Army in November and I've fallen in love with them ever since! I did a great Christmas vignette but I have decided to use it for my easter decorations. I crafted a birds next from Spanish moss and put some little blue eggs in it. I'm in love! Then, I was at a vintage sale a few weeks ago and came across the most beautiful blown glass cloche and grabbed it up for 8 bucks. I put a moss covered bunny under that one on my end table. I can't believe I didn't discover cloches until now. I love the ones you made yourself! I am looking for a spring craft, little $$$$$ for seniors to make, is this easy? I love your bunnies!!!!! Thank you! Yes, it is super easy and very affordable. I think they would love it!